Built in 1926, the Powell House is located at 330 North Crestway in Wichita's College Hill Neighborhood. 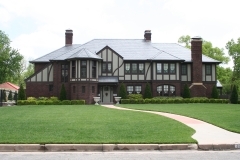 Prominent Kansas grain merchant Lon Powell hired the architectural firm Schmidt, Overend and Boucher of Wichita to design this Tudor Revival-style residence. 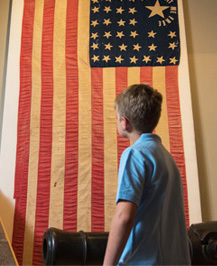 Powell served as the president of Wichita’s Terminal Elevator Company from 1919 to 1944. The property was nominated for its architectural significance as an architect-designed Tudor Revival residence reflective of the 1920s. The two-and-one-half-story house is clad in dark red-brown brick laid in a running bond on the first story, stucco and false half-timbering on the second story, and features a slate roof. There is a detached Tudor Revival-style carriage house behind the residence.